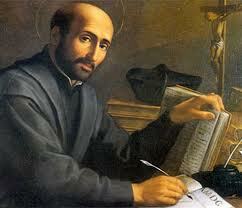 Today is the Feast of St. Ignatius of Loyola, founder of the Society of Jesus (also known as the Jesuits). This is a very special day for me as I attended a Jesuit university as an undergraduate and my prayer life is deeply influenced by Ignatian Spirituality. The theme of this blog is “Exploring Ignatian Spirituality and the intersection of faith, science and reason through the life and writings of Pierre Teilhard de Chardin”. Teilhard de Chardin exemplifies the values of the Jesuits, in his deep prayer life, in his engagement with the world, in his intellectual synthesis of science and religion, in his obedience to the Church and his Order and ultimately in his deep love of Christ. There are several hallmarks of Ignatian Spirituality in general and the Jesuits in particular. First, there is belief that we should “find God in all things.” God is not only found in the Alter or at Church. God is found in our everyday lives; our work, our play, our leisure, nature and most importantly, the people we interact with. Second, there is an emphasis on each of us developing as a whole person (physically, intellectually, emotionally, spiritually and psychologically) in the way God intended. Third, as gratitude for the gifts that God has given us, we are to offer these gifts to build God’s Kingdom on Earth to honor the greater glory of God. These hallmarks result in individuals who have a deep spiritual life who are also actively engaged in shaping the world towards God’s image. St. Ignatius and the Jesuits are in the spotlight with the selection of the first Jesuit Bishop of Rome (something I never thought would happen in my lifetime) in Pope Francis. The Society of Jesus is the largest religious order in the world and Jesuits are engaged in evangelization and apostolic ministry in 112 nations on six continents. Jesuits work in education (founding schools, colleges, universities and seminaries), intellectual research, and cultural pursuits. Jesuits also give retreats, minister in hospitals and parishes and promote social justice and ecumenical dialogue. “I do not like the reappearance of the Jesuits…Shall we not have regular swarms of them here, in as many disguises as only a king of the gypsies can assume, dressed as printers, publishers, writers and schoolmasters? If ever there was a body of men who merited eternal damnation on earth and in hell, it is this Society of Loyola. “ -John Adams. “Like you, I disapprove of the restoration of the Jesuits, for it means a step backwards from light into darkness….” -Thomas Jefferson. Ignatius of Loyola, born in 1491, was the youngest of many children (I have seen both 11 and 13) of a family of minor nobility in Northern Spain. As a young man, Ignatius Loyola was inflamed by the worldly ideals of courtly love and knighthood and dreamed of doing great deeds. This led him to become a solider. During a battle against the French he was wounded at the siege of Pamplona in 1521. His broken leg was badly set and, very conscious of his appearance, insisted that it be broken again and re-set. However, the surgery was not well done and Ignatius was left with a limp for the rest of his life. During his long period of convalescence he was not able to get the knightly romances he craved and had to settle for a life of Christ and stories of saints, the only books available in the place of his recuperation. However, these books had a deep effect on him. Reading the lives of Jesus and the saints made Ignatius happy and aroused desires to do great things. Ignatius realized that these feelings were clues to God’s direction for him. After Ignatius recovered, while on a journey, he stopped along the river Cardoner at a town called Manresa. He stayed in a cave outside the town, intending to linger only a few days, but he remained for ten months. He spent hours each day in prayer and also worked in a hospice. It was while here that the ideas for what are now known as the Spiritual Exercises began to take shape. It was also on the banks of this river that he had a vision which is regarded as the most significant in his life. The vision was more of an enlightenment, about which he later said that he learned more on that one occasion than he did in the rest of his life. Ignatius never revealed exactly what the vision was, but it seems to have been an encounter with God as He really is so that all creation was seen in a new light and acquired a new meaning and relevance, an experience that enabled Ignatius to find God in all things. This grace, finding God in all things, is one of the central characteristics of Ignatian spirituality. Ignatius himself never wrote in the rules of the Jesuits that there should be any fixed time for prayer. Actually, by finding God in all things, all times are times of prayer. He did not, of course, exclude formal prayer, but he differed from other founders regarding the imposition of definite times or duration of prayer. One of the reasons some opposed the formation of the Society of Jesus was that Ignatius proposed doing away with the chanting of the Divine Office in choir. This was a radical departure from custom, because until this time, every religious order was held to the recitation of the office in common. For Ignatius, such recitation meant that the type of activity envisioned for the Society would be hindered. It was also during this period at Manresa, still lacking in true wisdom concerning holiness, that he undertook many extreme penances, trying to outdo those he had read of in the lives of the saints. It is possible that some of these penances, especially his fasting, ruined his stomach, which troubled him the rest of his life. He had not yet learned moderation and true spirituality. This is probably why the congregation he later founded did not have any prescribed or set penances, as other orders had. After departing Manresa, he arrived in Barcelona, took a boat to Italy, and ended up in Rome where he met Pope Adrian VI and requested permission to make a pilgrimage to the Holy Land. Once he arrived in the Holy Land he wanted to remain, but was told by the Franciscan superior who had authority over Catholics there that the situation was too dangerous. (The Turks were the rulers of the Holy Land at the time.) The superior ordered Ignatius to leave. Ignatius refused but when threatened with excommunication, he obediently departed. By now, Ignatius was in his early 30s and decided to study for the priesthood. However, he was ignorant of Latin, a necessary preliminary to university studies in those days. So he started back to school studying Latin grammar with young boys in a school in Barcelona. There he begged for his food and shelter. After two years he moved on to the University of Alcala. There his zeal got him into trouble, a problem that continued throughout his life. He would gather students and adults to explain the Gospels to them and teach them how to pray with a preliminary form of the Spiritual Exercises. His efforts attracted the attention of the Spanish Inquisition and he was thrown into jail for 42 days. When he was released he was told to avoid teaching others. The Spanish Inquisition was a bit paranoid and anyone not ordained was suspect (as well as many who were ordained). There, within two weeks, the Dominicans had thrown him back into prison again. Though they could find no heresy in what he taught, he was told that he could only teach children and then only simple religious truths. Once more he took to the road, this time for Paris. At the University of Paris he began school again, studying Latin grammar and literature, philosophy, and theology. He would spend a couple of months each summer begging in Flanders for the money he would need to support himself in his studies for the rest of the year. It was also in Paris that he began sharing a room with Francis Xavier and Peter Faber. He greatly influenced a few other fellow students, directing them all at one time or another for thirty days in the Spiritual Exercises. Eventually six of them plus Ignatius decided to take vows of chastity and poverty and to go to the Holy Land. If going to the Holy Land became impossible, they would then go to Rome and place themselves at the disposal of the Pope for whatever he would want them to do. They did not think of doing this as a religious order or congregation, but as individual priests. For a year they waited, however no ship was able to take them to the Holy Land because of the conflict between the Christians and Muslims. While waiting they spent some time working in hospitals and teaching catechism in various cities of northern Italy. It was during this time that Ignatius was ordained a priest, but he did not say Mass for another year. It is thought that he wanted to say his first Mass in Jerusalem in the land where Jesus himself had lived. Ignatius, along with his companions, decided to go to Rome and place themselves at the disposal of the Pope. When they met with the Pope, he very happily put them to work teaching scripture and theology and preaching. It was here on Christmas morning in 1538, that Ignatius celebrated his first Mass. The following year, Ignatius and his companions asked for the Pope’s approval to form a community. They would place themselves at the disposal of the Holy Father to travel wherever he should wish to send them for whatever duties. A vow to this effect was added to the ordinary vows of poverty, chastity and obedience. Formal approval of this new order was given by Pope Paul III the following year on September 27, 1540. On the Friday of Easter week, April 22, 1541, at the Church of St. Paul Outside-the-Walls, the friends pronounced their vows in the newly formed Order, which was called the Society of Jesus. Ignatius was unanimously, though against his will, elected as the first Superior General and would hold the post for the rest of his life. He would also remain in Rome from where he directed the works of the Society. Other works he personally was involved in were houses for converted Jews and shelters for prostitutes. Given that so many members were scattered to so many places and often working on their own, obedience to the aims of the Society became very important for maintaining unity. It also explains the long letters which members on the missions regularly sent back to Rome to report on what they were doing. Among the most famous of these were the letter of St. Francis Xavier and of the missionaries working in China and North America. A tighter organisation was also called for because of the crisis situation caused in Europe by the Reformation. Peter Canisius was one of the leaders of the Counter-Reformation as were the many schools started by the Society. In missionary work, Francis Xavier was the pioneer with an astonishing career. He was followed by missionaries in India, China, Ethiopia, Latin America and North America. Spiritual direction, which was to complete rather than replace the work of parish priests, was undertaken by the Society. Ignatius, who had been plagued by chronic stomach problems due to the austere excesses in his younger years, died suddenly on 31 July 1556. By then the Jesuits numbered over 1,000 members in nine European provinces, besides those working in foreign missions. He was canonized with Francis Xavier on 12 March 1622 and declared Patron of Spiritual Exercises and Retreats by Pope Pius XI. This entry was posted in Ignatian Spirituality and tagged Ignatian Spirituality, Jesuit, John Adams, Manresa, Pope Clement XIV, Pope Francis, Pope Paul III, Spiritual Exercises, St. Francis Xavier, St. Ignatius of Loyola, teilhard de chardin, Thomas Jefferson. Bookmark the permalink. What a remarkable post! Thank you. Thank you for the very helpful biography!